DONNA — The police chief of the Donna school district has been placed on paid leave, according to the school district’s attorney. Alyssa L. Romero, of the firm Guerra & Farah PLLC, confirmed Friday afternoon that the district had placed Police Chief Roy Padilla on paid suspension related to a personnel audit and investigation of the district’s police department. The suspension, Romero said, is effective beginning Friday until the completion of the investigation into the police department. Asked what the investigation was related to, Romero declined to provide details citing the ongoing audit. When reached for comment, Padilla said he respectfully declined to speak about the action taken by the district for a later time. Padilla has been here before, in 2014, then interim Superintendent Jesus Reyna — who had sole hiring and firing power over the district police chief — terminated Padilla after a May 14, 2014, board executive session. 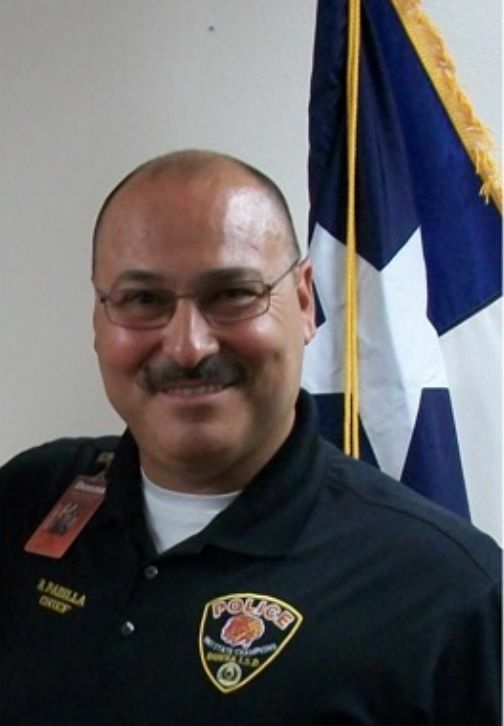 Padilla claimed he was fired from his position as district police chief because of politics — specifically that he refused to “babysit” a Donna school district police officer that he alleges has connections to local politiqueras. Five months after his termination, Padilla sued the school district for wrongful termination, seeking to be reinstated, which he ultimately succeeded in by mid-December of that year. A year to the date of his initial termination, Reyna was arrested and charged with bribing Padilla. Donna school district police launched an investigation into Reyna and Ernesto Lugo, a school board member, after officers said they attempted to pay off Padilla to drop a probe into theft and insurance fraud involving the superintendent and his family. Reyna was accused of paying Padilla $496.23 for unpaid mileage in exchange for his office to stop the investigation into Reyna, according to a criminal complaint. On April 15, 2015, Reyna recommended Joshua McCandless and Rodolfo Garza, the two officers investigating the case, be suspended or terminated along with Padilla, the complaint states. After a grievance was filed against both officers, Padilla was approached by Lugo, who began acting as mediator between Reyna and Padilla, according to the complaint. Lugo agreed and asked Padilla to “make the investigation go away.” Padilla then asked for payment on mileage he was owed by the district and for them to grant him a mileage stipend every month as part of the deal, the complaint states. Padilla received a payroll check with payment for the mileage as promised by Reyna and Lugo on May 20 2015, the complaint states. By August 2015, a grand jury declined to indict Reyna on the bribery charges.